On Sunday, 3rd September 1939, the Prime Minister Neville Chamberlain, announced that Britain had declared war with Germany. It could easily be assumed that for Ivybridge, situated in the rural Devon countryside, that this declaration would have little impact. However, with the naval port of Plymouth so close by, a prime target for enemy air strikes, Ivybridge soon began to experience the consequences of war. From 1939 until 1945, Ivybridge endured hardship just like all other communities in Britain. This ranged from the ‘Blackout’ restrictions of the early years to the food and clothing rationing which was set to continue for several years after the conflict ended. The tranquil countryside of Devon proved to be a popular destination for those fleeing the relentless bombing campaigns. Ivybridge, like other villages in the South Hams, welcomed evacuee children from London and other major cities, as well as providing safe refuge to the local people of Plymouth, escaping the terror of the night air raids during the Blitz. With the outbreak of war the government anticipated a threat from gas attacks. In response to this, over 44 million masks were manufactured and distributed during 1939. People were asked to report to school halls, village and church rooms, where local ARP wardens would ensure gas masks were correctly fitted. Masks were regularly tested with mobile gas testing vans in operation. By the middle of 1942 the threat of a gas attack had receded and from this time onwards masks were not generally carried apart from the wardens, special constables and others on duty. It is recorded that 2,000 gas masks were issued in Ivybridge. Ivybridge, situated far enough away from Plymouth not to attract enemy attention, provided relatively safe accommodation for various government departments during the war years, as well as a variety of naval, army and RAF units. Beaconville in Crescent Road was occupied by the Royal Marines and the Women’s Royal Naval Service (Wrens). A Nissen hut was erected in the grounds. A guarded supply and maintenance depot for the Air Ministry Works Department was also located in Costly Street, serving R.A.F stations in Devon. It employed numerous carpenters, electricians and painters travelling around the area, undertaking maintenance work. Then there was the concrete hut built on Western Beacon, used for observing enemy planes by the Royal Observer Corps, given the excellent viewing vantage. It was manned throughout most of the war by service personnel. In the event of low mist apparently, a roped walkway was erected linking the post to the neighbouring road back to Ivybridge. In 1943 Ivybridge welcomed US soldiers, who arrived in their hundreds, preparing for the Normandy landings in 1944. As the fighting moved across Europe more new faces appeared in the form of Italian and German prisoners of war, billeted in the area and made to work on the land until the late 1940s. This order placed severe restrictions on the showing of lights in homes, along streets and main roads. It also applied to all motor vehicles, bicycles and even the carrying of a hand-held torch, which had to have two layers of tissue paper over the lens. Any light which might draw attention to enemy aircraft flying overhead incurred fines and possibly imprisonment if the offence persisted. In 1944 this ‘blackout’ was replaced by a ‘dim out’ when some of the restrictions were lifted and in 1945 all lighting orders were finally removed. Under the Air Raids Precautions Act of 1937, local ARP organisations were set up throughout the country in anticipation of the outbreak of war. Plymouth was designated a co-ordinated area, with Plympton as a sub-control centre, under which Ivybridge operated. The town’s air raid precautions were made up of air raid wardens, a report post, located in the offices of the paper mill, two ambulance units, a first aid post, in what was the billiard room at Nirvana, a rescue squad and a decontamination squad in the event of a gas attack. 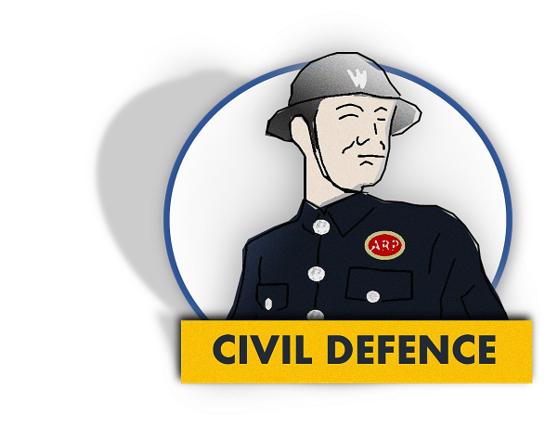 All members of the Air Raid Precautions Services were eligible to wear the ARP badge, provided they were serving on a voluntary basis in peacetime and had served for at least one month. It covered First Aid and Medical Services; Rescue and Demolition Services; Decontamination Services, Air Raid Wardens and Gas Detection Officers. Women volunteers were presented with a brooch carrying the badge. 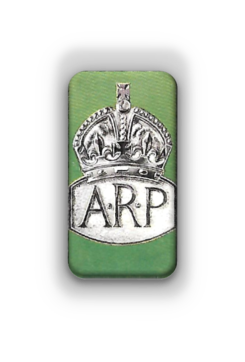 Up until 1939 ARP badges were made of solid sterling silver but from 1940 on, the badges were made of a cheaper “white” metal as silver was in short supply. A photograph of the Ivybridge Civil Defence Personnel taken in 1944. Stowford Mill played a vital part in the communications system during the Second World War. The Mill was managed by John Talbot, who in the first few months of the war was the chief warden for Ivybridge. After he was called up in July 1940, this post was taken over by his wife Helen and she continued in this role until the war ended. Telephone calls from Plymouth were taken at the Mill when there was a risk of bombing and the Mill steam siren would then be sounded to warn the village. After a few months, it was realised that this siren could not be heard all over the village so a second siren was erected opposite the London Inn, activated from the Mill. Members of staff manned the ARP report post at the mill 24 hours a day for the whole of the war. Ivybridge had four posts as the section was so scattered. There were two in the village, one at Harford and one at Lee Mill. Wardens patrolled in all weather conditions and tested and fitted gas masks. When any vehicle was left it was to be immobilised by removing its rotor arm from the engine, the ignition key taken out and the doors securely locked to prevent enemy spies or escaped prisoners of war gaining access to a vehicle. This order was rigidly enforced by local special constables or police. Reference: ‘Ivybridge during the Second World War 1939-1945” by Arthur L. Clamp. Up until 1939, the badges were made of solid sterling silver but from 1940 on, the badges were made of a cheaper “white” metal as silver was in short supply.